Ricky Alleyn, who first appeared in Spinsters in Jeopardy, is now 21 and has taken himself to a secluded island to write a novel. Or think about writing a novel. Or look for distractions so he can avoid writing a novel. The distractions abound, mostly in the form of colorful local characters, so all is beer and skittles until Ricky stumbles across a murder and then gets himself kidnapped. Which is too bad for Ricky (and the murder-victim), but dandy for the reader, as it brings Inspector Alleyn to the island, and he’s on top form. 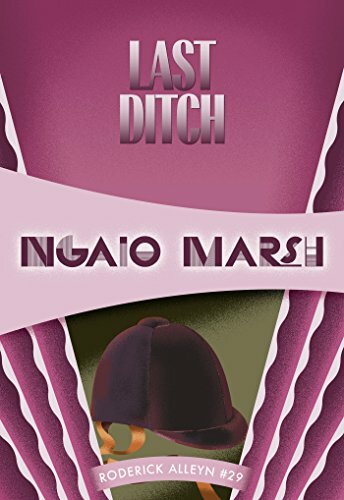 A subtheme involving drug-running may strike a jarring note, but remember, Last Ditch was first published in 1977, and as such, it offers a remarkable look at what happens when the characters and conventions of the Golden Age fetch up in the distinctly tarnished recent past.